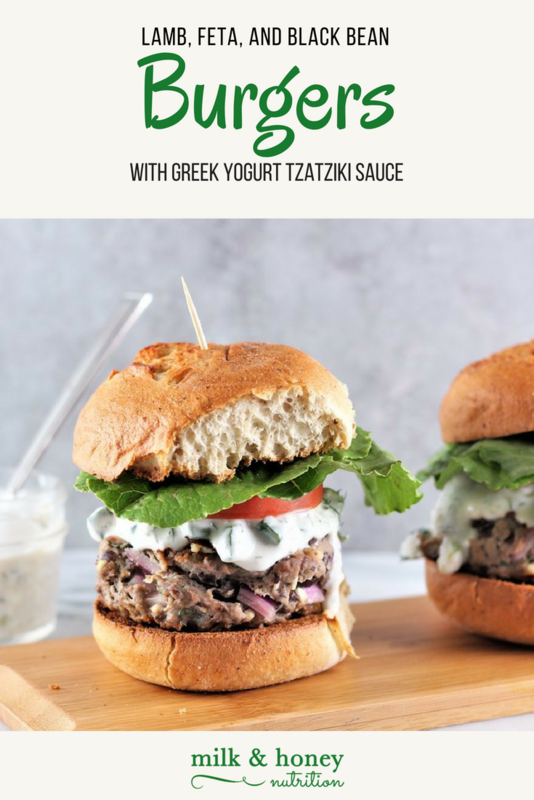 These Lamb, Feta, and Black Bean Burgers with Greek Yogurt Tzatziki Sauce are perfect for summer. Packed full of fiber (thanks to the onions and black beans) and flavor, everyone will love these! And the homeade tzatziki sauce is the perfect way to finish them off! In a medium sized bowl, add all of the burger ingredients. Using your hands, mix together thoroughly. Using an ice cream scoop, scoop out meat mixture onto a parchment lined baking sheet. Refrigerate scoops for 30 minutes. Remove the chilled meat mixture from the refrigerator and press two of the scoops together to form one patty. Repeat this until you have 5-6 burgers. You can now cook the patties on the grill or in a skillet. 5-6 minutes/side or shorter depending on how much you like them cooked. Serve on your favoite buns with the tzatziki sauce and other toppings. Enjoy!